2012 Olympics: Indoor Season Is A Wrap!! The indoor track season is finally over. 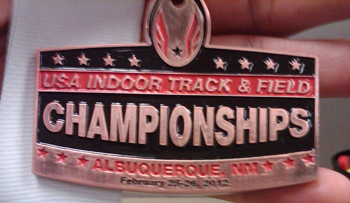 I competed in my final meet, USA Indoor Track and Field Nationals, in Albuquerque, New Mexico. I placed 3rd with a jump of 7 feet 5 inches. The person that came in 2nd place jumped the same height, and the 1st place person jumped 7 feet 6 inches. It was a close competition. The top two finishers qualified for the Indoor World Championships in Istanbul, Turkey. I was a little upset that I just missed the team, but the good thing is that it gives me confidence heading into the outdoor season. Posted in 2012 Olympics	7 Comments on 2012 Olympics: Indoor Season Is A Wrap!! It’s been 10 days since my last competition and I needed the down time to get ready and rest up for my next competition. After each competition, I like to evaluate the great things I did and the mistakes I made, similar to how Soliant evaluates a call to a candidate or client. Correcting my mistakes and highlighting the successful things I do is the perfect recipe for success.